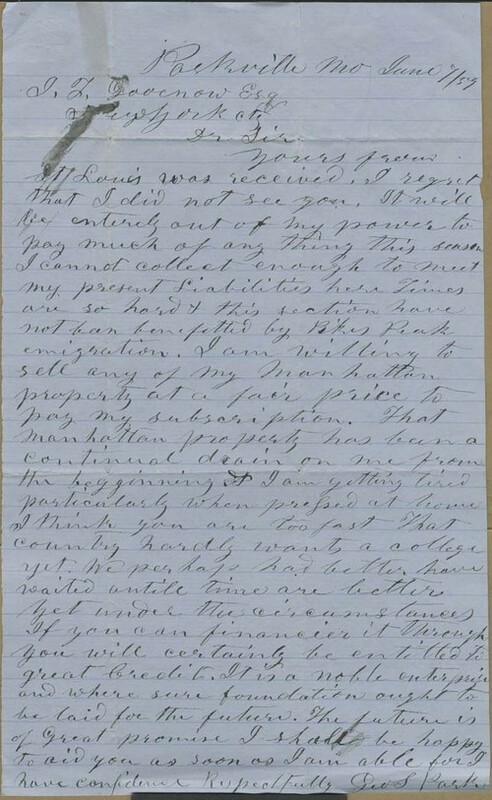 George Park wrote from Parkville, Missouri, to Isaac Goodnow in New York City. Park confessed to Goodnow that he would not be able to pay into their investments this season, on account of hard economic times. However, he was willing to sell his property in Manhattan, which had been a "continual drain" on him from the beginning. Park criticized Goodnow's efforts: "I think you are too fast That country hardly wants a college yet. We perhaps had better have waited until times are better."